It was not a very big order but I have been wanting a rainbow die for a while now so I was very happy to pick this one up... and who could go wrong with distress markers at a $1.70/ea (I think...lol). 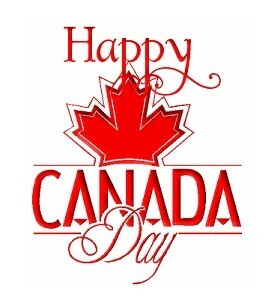 I just wanted to take a moment to wish all my fellow Canadians a Happy Canada Day!!! I hope that you have a wonderful day with ever plans you have in store for today. image found from a Google search! Just in time to celebrate Canada Day with us, our tiger lily has bloomed this morning :) To me when the tiger lily's are in bloom it means summer has arrived!! It seems that almost every where I have lived there have been tiger lily's somewhere close to me and I have always loved the bright burst of colour shinning through all the green that surrounds them.